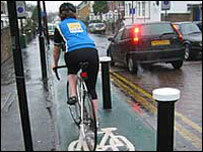 Parents should abandon the school run and encourage children to cycle to school, the government will say later. Transport Secretary Douglas Alexander will announce that an extra £15m will be spent over the next three years on the Cycling England initiative. This will provide cycling proficiency lessons for 100,000 children and more cycle lanes will be linked to schools. The Tories welcomed the news but said the government had so far failed in its aim to get more people on their bikes. The extra money will mean that a total of £30m will be spent on the initiative over the next three years. Mr Alexander will tell a transport and climate change conference in Oxford of his desire to move away from "the back of the car generation". "If we can get them into cycling early with a strong focus on safety, there are real potential benefits," he will say. "Seemingly small choices like this can have big impacts - for the health of children, on congestion and the environment." Phillip Darnton, chairman of Cycling England - the independent but government-funded expert body - said the new commitment to cycling represented "a tremendous opportunity". "It will underpin Cycling England's determination to ensure that in the long term every child has the opportunity to learn and enjoy safe cycling before they leave primary school," he said. The government also spends about £35m a year through local authorities. But that is much less than many other European countries. The Conservatives said that, despite the government's pledge to treble cycling trips from the 2000 level by 2010, there had been a decline in the number of cycle journeys in Britain. Shadow transport secretary Chris Grayling said the news was "a move in the right direction". "As always, we will remain sceptical until we actually see some evidence that the government is keeping its promises," he added.